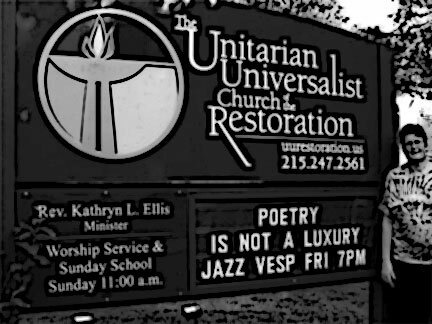 This morning at the Unitarian Universalist Church of the Restoration (in Philadelphia) I did a reading from Maya Angelou’s poem “The Human Family” and a talk on “Difference” — the theme of this week’s service. To see the reading and the reflection on YouTube, click here. (You can also view the YouTube video at the bottom of this post. I am different, of course. We all are. In my view that’s what makes life interesting. I would say I gravitate to difference. I’m a lesbian-feminist who came of age in the early 1980s and I had the good fortune to hear and meet many of the icons and writers of that era — including Audre Lorde and Adrienne Rich. It was at the celebration of Audre Lorde’s life — the “I Am Your Sister” conference held in Boston in 1990 two years before she died of cancer at the age of 58 — when I went to one of the conference’s “Eye-to-Eye” sessions. There, I really began to understand difference. The idea behind the “Eye-to-Eye” sessions is that you break into a smallish group of people from a similar background and have a heart to heart discussion. It was based on Audre Lorde’s philosophy that she writes about in Sister Outsider, a collection of her essays, that we cannot love each other until we love ourselves. At the conference, I chose the white working class women Eye-to-Eye session. The other Eye-to-Eye group that I could have chosen was white lesbians — but lesbians tended to be everywhere in my world back then and it seemed more important for me to focus on class. I still remember being in that room with the tall windows and high ceilings — sitting on the floor in a circle of women. It was like being back in my high school bathroom. But this time we were honestly discussing our lives instead of masking our pain with drugs and alcohol. As I recall, the discussion that we had in that room was liberating. To make a long story short, I have absolutely no connection with anyone from my background — except that my partner and I are lucky enough to still have my 97 year old father. But in this election year, I was reminded of my background, every time I turned on the television news. I found the racism at the rallies — and I think you know which rallies — to be painful. I also find it painful — and appalling — that someone — some unnamed someone in power — is fanning the flames of fear and hatred. But I also do not think that all of the people in the white working class will be taken in to vote against their own interests. I also strongly suspect that the media is just showing us a slice of white blue collar voters who are racist — etc. — and that most people have neighbors and co-workers of all races including African Americans, Muslim-Americans, and Mexican Americans. And even if they don’t, white working class voters can think for themselves and realize that racism and xenophobia are wrong. This election is getting under my skin. The stakes are high, and it feels personal. When people tell me they are not planning to vote — educated people, who might feel more privileged than they are under the circumstances — it kind of makes me crazy. Of course, this is not a good feeling. I meditate almost every morning — and it came to me during my meditation that I need to be more compassionate. Gere talks about the fact that there are times that this is difficult, and that these are the times when this thought turns a destructive emotion into love. I have just started this practice and don’t know where it will take me. I suspect, though, that it will make me even more aware of the fact that as Maya Angelou writes in “The Human Family” that we are more alike, than unalike. Oh, and remember to vote. This is a quote from Audre Lorde, the self-described “black, lesbian, mother, warrior poet,” who dedicated her art and life to social justice. Audre lived from 1934 to 1992. I first came across her work in the early 1980s. I was in my twenties and was a freshly minted lesbian-feminist. I was fortunate to come out in a diverse cultural and political women’s community — which is what we called it then — which described a community based on the values of feminism and included lesbians, bisexual and heterosexual women and men of all stripes. I was fortunate to have seen Audre read in person several times, including in Philadelphia and at the Audre Lorde “I Am Your Sister” conference in Boston held in 1990 two years before she died of cancer at the age of 58. Audre Lorde authored 15 books of poetry and prose. She was Poet Laureate of New York State from 1991 to 1992. She was a major poet. But because of racism, homophobia, and sexism, she was not taught in the 1970s in the public high schools when I was a student. Audre Lorde’s work is powerful and is about empowerment. If she had been taught, I know for a fact that her work would have saved plenty of lives. …..”it is through poetry that we give name to those ideas which are — until the poem — nameless and formless, about to be birthed, but already felt. That distillation of experience from which true poetry springs births thought as dream births concept, as feeling births idea, as knowledge births (precedes) understanding. “For each of us …. , there is a dark place within, where hidden and growing our true spirit rises, ‘Beautifully/and tough as chestnut/stanchions against our nightmare of weakness/’ … and of impotence. Poetry is something that has always made me feel more fully alive. It sheds new light on our commonalities and differences. It enters the mystery and enlarges what is possible.